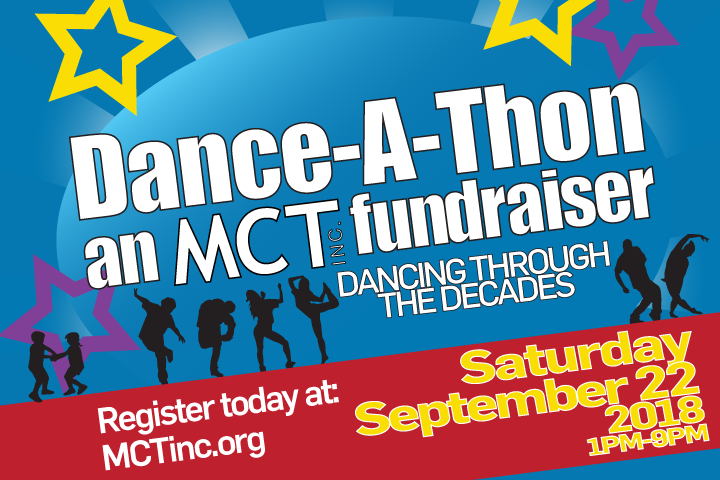 Dance-A-Thon - An MCT Fundraiser! On Saturday, September 22, you are invited to get down with your bad self for a very good cause! Help us keep our performing arts programming accessible to all ages and abilities by participating in our eight-hour dance party through the decades. The MCT Dance-A-Thon is an all-ages fundraiser that will feature popular hits from the 1920s to the present, along with games, costume and dance contests, raffles, drawings, and more. You can form a team with family, friends, or co-workers or take Billy Idol’s advice and dance with yourself! Whatever you decide, we’ll make sure you’re nourished and hydrated with snacks, beverages, and dinner at the end of the evening. Registration is $25 and all participants are encouraged to raise $100 to benefit our scholarship program. Want to come and enjoy the party, but not sure about the dancing part? Spectator passes are only $10 and include a drink ticket.